Prior to Monday’s Valero Alamo Bowl game between the Texas Longhorns and Oregon Ducks, the players had a little fun at the pre-game talent show. 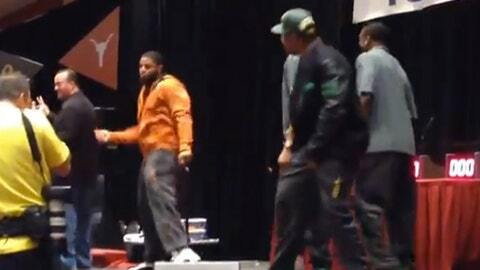 Oregon took the stage first then quickly challenged the Longhorns after doing a little "Dougie." And the Texas volunteers did not back down. The debate can go back-and-forth as to who, out of the two schools, was the official winner, but really, it’s the fans that won. Letâs hope Monday’s battle on the field is as entertaining as this dance-off.